A lovely lady on Twitter asked me to do a tutorial on a fishtail plait, so here it is! I hope I made this as clear as possible with my wiggly fingers - it's really simple when you do it, but watching it, it looks 100X more complex than it actually is. All you will need is a comb and a hair elastic (optional). 1. Split your hair into two big sections. While holding both sections, use your index finger to grab a small bit of hair. 2. Then, pull that small bit of hair around the same section, a bit like doing your shoe laces. 3. Holding that small section with the same hand, do the same as part one to the other big chunk of hair. 4. Collecting the older small bit of hair in the other big section, grab a new tiny section of hair from the back of the big bit of hair and bring it round to the front. 5. Then grabbing the new small bit of hair, collect it into the opposite section. So basically it's like doing a normal plait from the inside-out rather than in outside-in. 6. Continue steps 1-4 all the way down. I then back-comb the ends to hold the plait in place, you can use a hair elastic instead it's absolutely up to you! To Finally finish the look and use my fingers and thumbs to push the braid forward, to make it bigger and messier. Then you are done! I'm so sorry if these instructions make no sense what so ever, i'm hoping the images are a bit clearer than my rambley step-by-step. Can't wait to have my hair extensions to try this asap! I've always been in love with a fish tail braid!! Fabulous!! I love fishtail plaits,especially for school. The fishtail looks amazing on you! I love fishtail plaits, there my go to style when I haven't washed my hair! Would love it if you entered the giveaway over on my blog!! I love fishtail braids, and your hair is always so pretty. great tutorial, I've always wanted to know how to do these! wow it's pretty awesome! thank you for sharing <3. Fab tutorial, so easy to follow I'm sure even I can manage it! Love your blog and your tuto! Oooh, so pretty, love it! I'm going to try this out. Great post, your hair looks so pretty! this is amazing! you're are so ridiculously pretty! thanks for the tutorial - I have been trying to get this down right!! your blog is very lovely and interesting. maybe follow? im glad if you visit my blog, too <3 keep in touch! I wish my hair was long so I could do this! Just come across your blog! What a lovely find! I've been wondering how to do this myself for a while. I'm gonna go try to now! Wow! Nice tutorial. I love fish tails!! You're so pretty, as is the hairstyle. I love the step by step picture guide. It's a really clever/ useful idea! So glad I've found this tutorial, I've been wanting to know how to do one for a while but not been sure how! Ok I am totally obsesse with your blog. Love your tutorials, and you are SO gorgeous. PS>love the makeup how to in the last post! You look amazing! Such a lovely blog! Great tutorial I learnt how to do fish tail plait when I was doing my Hairdressing its a great look! and you went into alot of detail to show how to do this. Thank you so much for this tutorial! I have watched billions but never had success. We love your blog and are new followers. 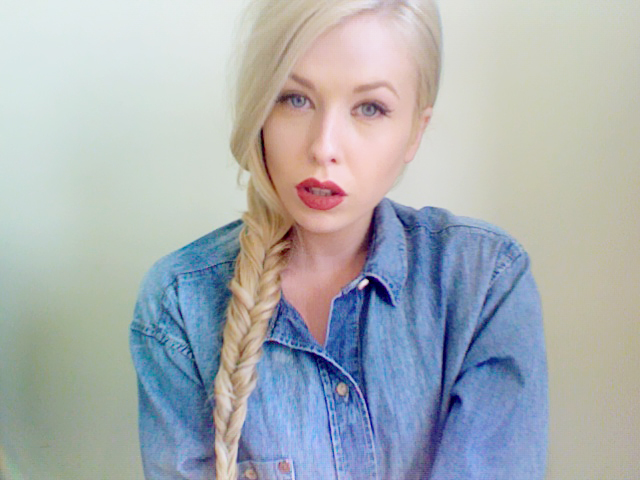 I love braiding my hair in fishtails <3 you are really pretty and I love your blog. If you have time, have a look at mine and if you like it, maybe we can follow each other. I love your blog :) I folllowed as soon as I found it. Lovely tutorial too, looking forward to trying it out. Ahhh I gave up around step two haha, I'm a fail BUT I love how you did this with the gifs. So very cool. Dear, you are absolutely gorgeous. And this was a great tutorial! I love you blonde hair :) and great blog. I love the fishtailbraids! What a great way to make a tutorial! I just found your blog. It is fantastic, i love it. you are gorgeous. I will follow, I would love for you to check out mine. Simply beautiful braid! I think your instructions make sense - and all the more so with this charming series of photos. My own hair is far too thin to pull of braids like this (it's been thinning for years due to alopecia), but I'm planning on buying a wig to use as my "full time hair" in the near future, and thus hope to be able to pull of a much wider array of styles (including cool braids like this) again for the first time in many years. U had great idea for a blog! You are a beauty, and you have a very sweet profile. I love love the gifs, they make hair tutorials easy to follow!